Rick Kennedy draws on his background as a software engineer to position himself as a problem solver. He’s running on a platform that includes protecting access to quality, affordable health care; pathways to citizenship for undocumented immigrants; and reforming the tax code to put money in the hands of consumers, not corporations. It was also refreshing to see three candidates—including Churchman, who disagreed with Kennedy and Mantey on many issues—debate in good faith and with respect for facts and for each other. Contrast this to absentee Rep. Bill Flores, who is notorious for blocking constituents on Twitter, deleting constituent comments on Facebook, and whose campaign amplifies atrocious memes by Dinesh D’Souza. 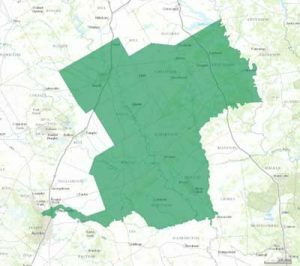 Spanning Waco to the north, College Station to the East, and a middle finger jabbing through Pflugerville and North Austin, TX17 is one of our more embarrassingly gerrymandered districts. Candidates campaigning in this district have a very broad constituency, from college students and faculty at Texas A&M and Baylor, to tech workers in Austin, to vast rural communities. The good news is that progressives are learning that you don’t need a different message for each audience you speak to. The planks of Rick Kennedy’s platform—such as a fair tax code; quality health care that includes a public option; humane immigration policy; and investment in clean energy to combat climate change—resonate with the majority of Americans regardless of demographics. Rick Kennedy is an experienced problem-solver, who will bring much-needed pragmatism, empathy, and technical acumen to Congress. 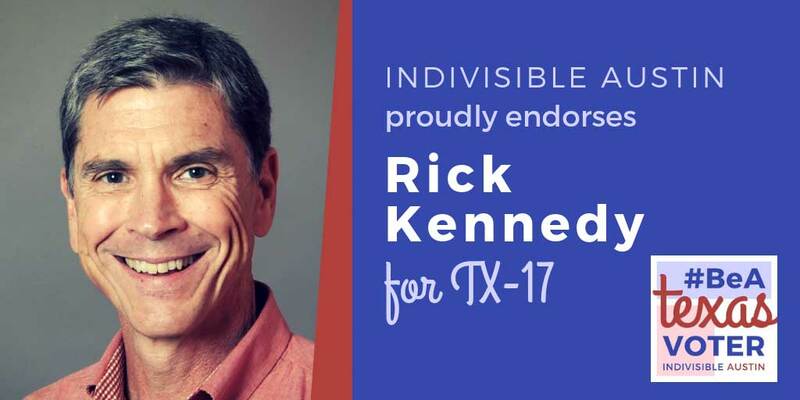 Indivisible Austin is proud to give Kennedy our endorsement. 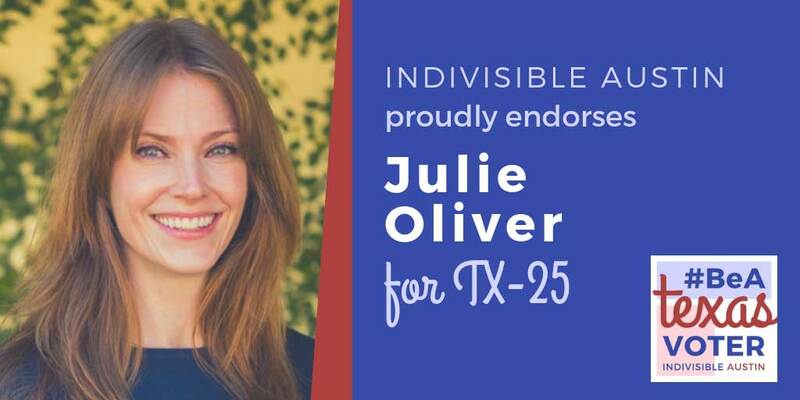 Indivisible Austin is proud to endorse Julie Oliver to be the Representative of Texas’s 25th Congressional District. In May Oliver won a hard-fought runoff to become the democratic candidate for TX25, and she hasn’t stopped fighting since. Health care is the central issue of Julie Oliver’s campaign. She is committed to universal health care, favoring a Medicare-for-all style system. As a lawyer working in health care law and finance, she brings real expertise to the problem. Oliver focuses on an array of groups whose health care is often marginalized: rural communities, low income women, and women of color, especially African-American women, receiving maternity care. Importantly, she has made not just insurance coverage, but a functioning health care delivery system, especially in challenged rural communities, central to her campaign. The care and thought she has shown for these communities contrasts dramatically the incumbent, who frequently speaks about the need to strengthen rural health care but has voted to end or sabotage the ACA over and over again. There are a host of other issues where we appreciate the stands that Julie Oliver is taking. For instance, on gun control, she argues for universal background checks, excluding domestic abusers from purchasing weapons, and overturning the Dickey Amendment, which prevents the government from studying gun violence as a health issue. On climate change, Oliver is fighting for the United States to rejoin the Paris Climate Accords and invest in clean energy as a way to reduce carbon emissions and create new jobs and industries for the future. On education, Oliver wants to protect teacher retirement, keep public school funds out of the pockets of private schools, and shut down the school-to-prison pipeline by providing funding for schools that want to reform their unreasonably punitive discipline policies, which all too often lead to students of color in police custody. However, what really makes Julie Oliver special as a candidate and future Congresswoman, is her approach to TX25. The district is very large —nearly the size of Massachusetts—stretching from south Austin to west of Fort Worth. It is, of course, radically gerrymandered to protect the Republican incumbent. But from the beginning of her campaign, Julie has been dedicated to representing all of TX25. As we mentioned above, rural health care has been an important part of her overall health care position, not because rural voters are her core constituency, (traditionally they aren’t) but because it’s important to the future of the district as a whole and the people who live in it. Julie Oliver has made it a point from the beginning of her campaign to drive to every corner of the district, putting thousands miles on the odometer. She’s not so much taking a page from Beto O’Rourke’s playbook as she is co-authoring the new story of how Democrats in Texas and around the country campaign. She goes everywhere, listens to and learns from anyone, and fearlessly explains how she and the Democratic party are fighting for them, even if they aren’t supporting her yet. It’s the only way to win over voters. 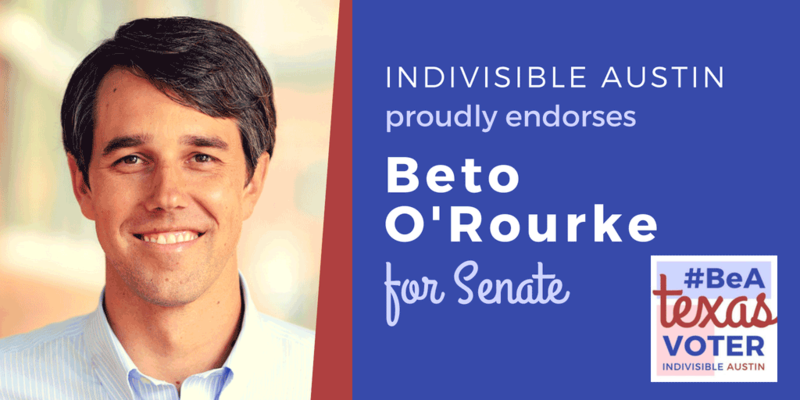 It’s the right way to govern, and it’s why Indivisible Austin is proud to endorse her candidacy. Mike Siegel is the Austin city attorney who sued Gov. Greg Abbott to stop SB4, the worst anti-immigrant law passed in recent memory. If that were the only thing we knew about him, we’d still probably give him our endorsement. But that just scratches the surface. Like most Texas Congressional districts TX10 is big and stretches from northwest Austin to far west Houston covering parts of eight counties. Of those eight counties, SEVEN are listed in the state’s post-Hurricane Harvey disaster declaration. One year later and 10 percent of people displaced by the storm still can’t go home, and 15 percent of homes damaged by Harvey are still unlivable. We’ll get to that in a minute. When Mike Siegel talks about the key issues he’s running on, health care is always at the top. 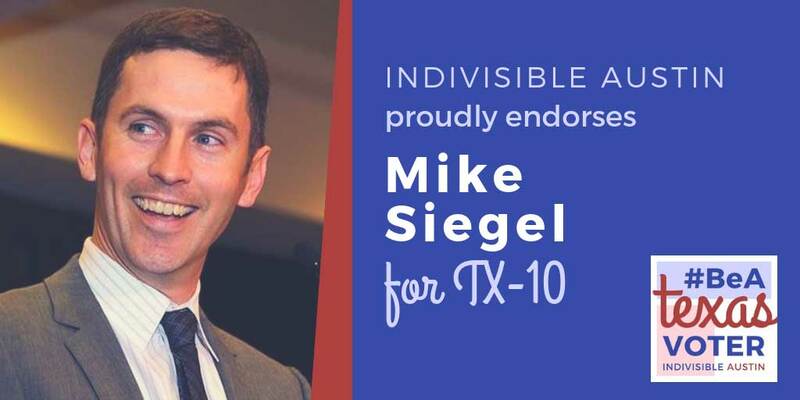 Instead of working to take health insurance away from millions of Texans, as the incumbent has voted to do many times, Siegel supports health care for all. His vision of guaranteed health care has no exclusions for pre-existing conditions or reproductive health care. He is also critical of the massive tax scam that benefited the incumbent (the fifth-wealthiest member of Congress and biggest water-waster), and which Congress wants to pay for by cutting…you guessed it…health care! Back to that disaster declaration. Siegel has made flood control and response one of his key campaign issues. He has argued that we need a national flood control and response strategy. Safety and security dangers posed to Texans by hurricanes and flooding are among the key issues he believes he can address in Congress. We agree that Texas and the federal government both must act to protect our state from the increased threat and destruction caused by Gulf Coast hurricanes, and which disproportionately impact poor communities and communities of color. On immigration and racial justice issues, Siegel comes from a very important and oft-ignored perspective: that our policies must reflect humanity and common decency. He will fight for a permanent solution for DACA recipients, and to put an end to the cruel anti-immigrant policies the Trump administration and the incumbent support. Even beyond that, Siegel sees how inequitable our policy-making process is, and how it creates discriminatory outcomes for communities of color with respect to everything from policing to education to voter access. There are other policy areas where we’re in agreement, including gun violence prevention. Siegel supports universal background checks, closing the gun show loophole, and red flag laws. 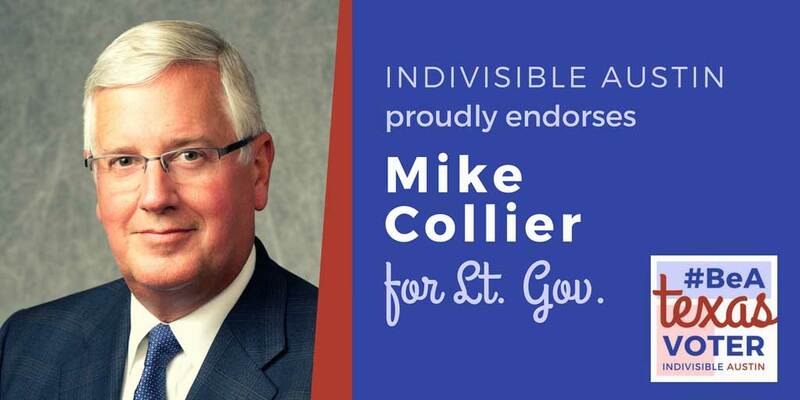 The thing Mike Siegel gets about public service that the incumbent doesn’t is that our representatives work for us and we expect them to solve problems. Instead of hiding from constituents out of fear they might ask hard questions and demand actual answers, Siegel is on the street knocking doors, talking to voters face-to-face, holding town halls, and treating his future constituents with common decency and respect. Joseph Kopser, a 20-year military combat veteran and tech entrepreneur, won a hard-fought primary battle that went to a runoff election. 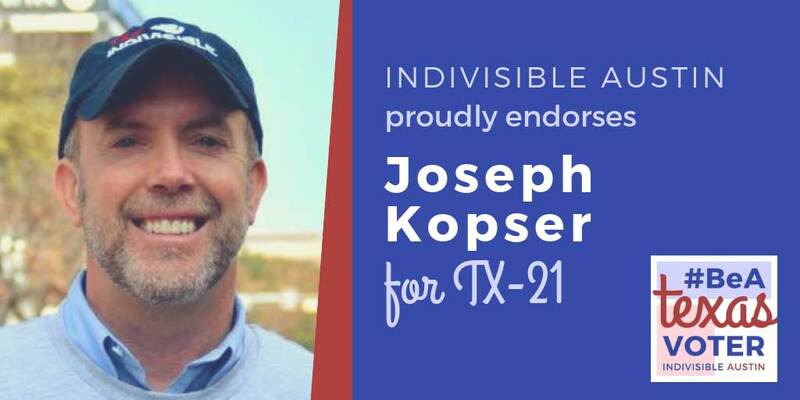 Most progressive groups favored his runoff opponent, Mary Street Wilson, but organizations like TX21Indivisible ATX have since endorsed Kopser. 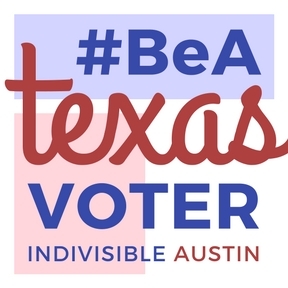 When Indivisible Austin considered its endorsement, we first determined that we would follow the lead of in-district grassroots organizations like TX21 Indivisible ATX. We then reviewed Kopser’s positions on the top tier issues that have been our focus since Day One. Kopser’s campaign supports a platform to reduce gun violence, including a ban on assault-style weapons and high-capacity magazines; national background checks; cash-for-guns trade-in programs; and protection of common-sense state gun regulations, such as bans on open or concealed carry. Joseph Kopser has demonstrated a steadfast wiliness to engage with constituent and progressive groups, crisscrossing the district and participating in multiple Town Halls and candidate forums. Contrast this to his opponent, Chip Roy, who is also running for the open seat following Rep. Lamar Smith’s retirement. Roy’s past stints as Ted Cruz’s chief of staff and Ken Paxton’s first assistant DA are troubling enough, but he seldom makes public appearance, choosing mainly to meet with donors at ticketed events. Is this who we want representing parts of Austin, San Antonio, and Hill Country? TX21 residents have a choice in this election: A veteran who served his country and now fights for progressive causes, or another GOP Swamp Creature. Staying home is not an option. Joseph Kopser has our full backing as the person best qualified to protect our most vulnerable citizens and to provide an important check on executive power. As founder and former president of One Nation One Vote, a non-profit dedicated to fighting gerrymandering and overhauling the electoral-college system, Nelson shares our vision of a fair and functional democracy. A lawyer, UT professor, and former clerk for Supreme Court Justice Sandra Day O’Connor, Nelson also brings serious bona fides to an office sorely lacking adult supervision. Nelson has committed to rescinding Texas’s lawsuit to end DACA on his first day in office. He calls the separation of families on our border a “humanitarian crisis,” and will finally bring the regulatory power of the state of Texas to bear on the actions of ICE, CBP, and their contractors. As we write this, Texas—led by Ken Paxton—and 19 other states are going to federal court in an effort to end health care protections for millions of people, including the 130 million Americans with pre-existing conditions. The single most popular provision of the ACA, with broad support across the political spectrum, and Ken Paxton wants to take those protections away from us. 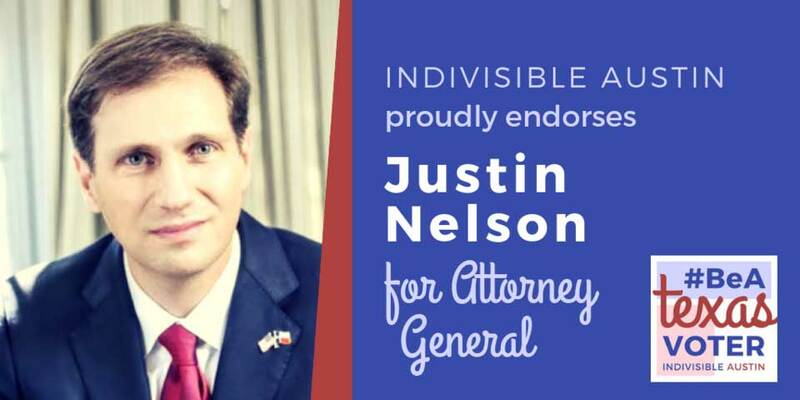 Justin Nelson is committed to protecting health care for all Texans, fighting for protections for patients with pre-existing conditions, supporting women’s health, and fighting health care discrimination of all types. Unlike his opponent, who is awash in personal and systemic political corruption, Justin Nelson is committed to combating public corruption, first by shining a light on the money that pervades Texas politics. Nelson has promised to defend the Texas Ethics Commission from several lawsuits intended to weaken its ability to regulate campaign finance. Paxton may refuse to fight these suits brought by his donors, but Justin Nelson believes that the government of the state of Texas should serve the people of Texas, not the highest bidder. He’ll fight to make sure we have a government we can trust. We are pleased to endorse Justin Nelson. Texans deserve an Attorney General who will put their needs first, instead of protecting corporate interests and political patrons—or facing jail time. For Comptroller, small-business owner Joi Chevalier would bring experience and humanity to the important role of managing the state budget. 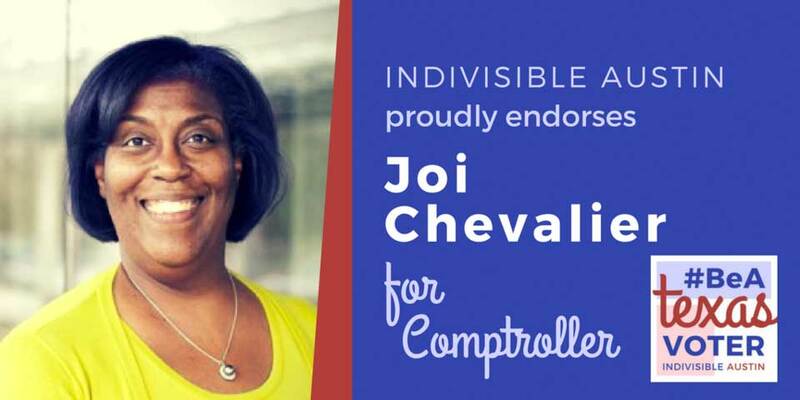 Rather than waste our money on bathroom bills, further militarizing our border, and breaking up families, Joi Chevalier will focus on the role the state budget can play in fostering more, not less, opportunity in the state. For example, her commitment to diversifying revenue sources suggests Chevalier will bring new creativity and life into the Comptroller role, an energy that is sorely needed. 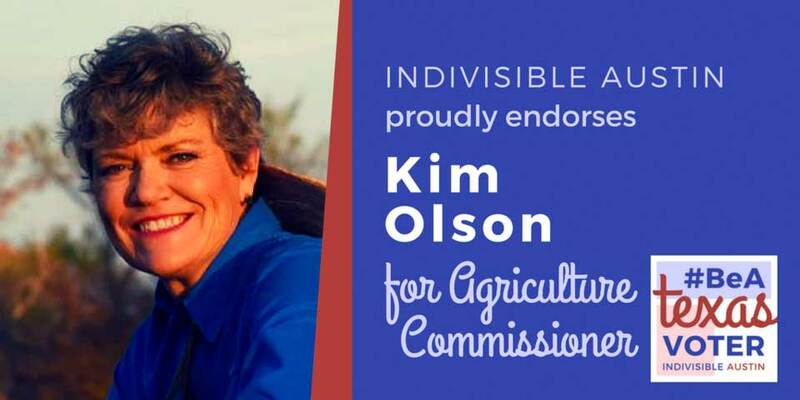 For Agriculture Commissioner, where Sid Miller has been a national embarrassment since 2014, Kim Olson gets our nod. Kim is a retired Air Force pilot and an organic farmer who is listening to the concerns of Texans in all of our 254 counties. Her campaign has demonstrated she is eager to listen to the concerns of both those who grow our food as well as the families that purchase it. Her life has been one of service—often in a trailblazing manner—both during her military career and afterwards, as she worked in education and on behalf of veterans. In 2014, she was rightly inducted into the Texas Women’s Hall of Fame and we are proud to offer our endorsement to her race.